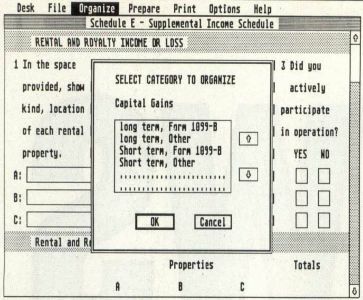 Double Eagle Software has released the 1988 version of its popular The Tax Advantage. They report that the program is now capable of importing data from other financial programs, including Phasar and the IBM PC versions of Dollars and Sense, Managing Your Money and The Home Accountant. According to Harry Koons, president of Double Eagle Software, "The Tax Advantage takes the data you have entered all year in these accounting programs and transfers it to the appropriate line of the tax form automatically." Five new forms, over and above the standard forms, are included with this year's Tax Advantage. Five new forms, over and above the standard forms, are included with this year's Tax Advantage: Schedule R, Credit for the Elderly; Form 2119, Sale of Principal Residence; Form 3903, Moving Expenses; Form 8598, Home Mortgage Interest; and Form 8615, Tax for Children Under 14. Also included in the new version are worksheets for Social Security benefits and IRAs.